The kidneys are a pair of bean-shaped organs that are responsible for the filtration of wastes from the blood. 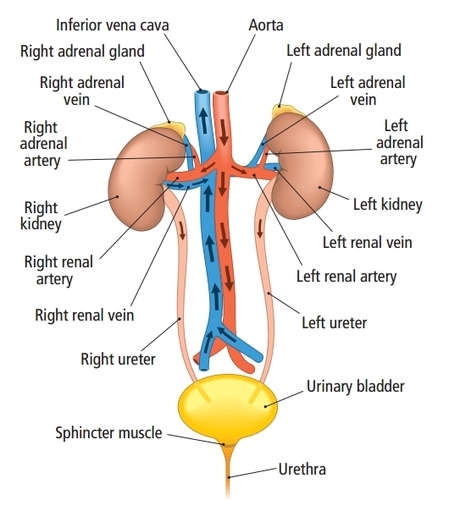 Blood entering the kidneys through the renal arteries is divided among many arterioles and capillaries that end in structures known as Bowman’s capsules. Blood plasma is separated from blood cells by small sieve-like pores in the Bowman’s capsules. The blood plasma filtrate passes through many tiny tubules found throughout the tissues of the kidneys. Cells lining the tubules actively absorb and return valuable nutrients – such as glucose, protein, and sodium – to the blood while allowing waste products and excess ions to remain in the tubules. The waste products, ions, and water remaining in tubules eventually reach a collecting duct as urine that will be eliminated from the body. Water in the tubules is selectively reabsorbed depending on how hydrated the body is, forming either concentrated urine to conserve water or dilute urine to remove excess water. The filtered blood leaves the kidneys through the renal veins and returns to the heart to circulate throughout the body.